Custom Tape Measure Keychains Personalized in Bulk. Promotional, Economy. Best price in USA, Canada. Bulk custom imprinted tape measure keychain with 39 in. metal tape measure and split ring. 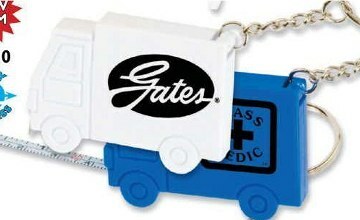 We also supply blank (not imprinted) tape measure keychains for $0.69 each. Budget Prices in the USA and Canada for personalized tape measure keychain in bulk. American clients pay no taxes, Canadian clients don't pay PST. We will send you a proof for your approval before production. Basic unit prices include your 1-color imprint. Add $0.20 per unit for each additional imprint color. Setup: $40.00 per color; $20.00 on re-orders. Estimated Production; 5 days after art approval. Please call for faster delivery. Blank tape measures ship next day. Ideal for pointing out "free delivery". Imprint Size: 1-1/4" x 3/4"